On January 19th, 2019 New York City will once again join the international community to march in support of equality and promote civil rights for every human. The Bryn Mawr Club of New York City will be participating. Join Us! 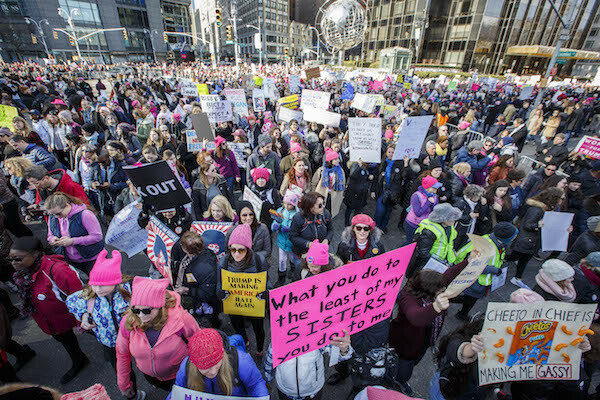 Please note that the New York City march is run by the Women’s March on NYC Alliance and is not associated with the national Women’s March organization. The Bryn Mawr Club of New York City and the Women’s March on NYC Alliance do not support any form of discrimination, including anti-Semitism, homophobia, racism, sexism, transphobia or white supremacy. We are joining such groups as JCC New York and other Seven Sisters. Any and all are welcome to march with us, regardless of their affiliation with Bryn Mawr or the Bryn Mawr Club of New York City. Please bring your partners, friends, children, etc. We want this to be a big, joyous group. We want to be joined by members of other BMC alumnae/i groups, Seven Sisters, Haverford alums, EVERYONE! Meet us at 10:00 AM in front of the Beacon Theater, 2124 Broadway between 74th and 75th St. We’ll start walking at 10:30 AM. Route: Marchers will line up along Central Park West between 62nd and 82nd St. The main entrance will be 71st St. and Central Park West. A rally will take place on 61st St. and Central Park West between 11:00 and 11:30am. After the rally, we will march south around Columbus Circle, east on 59th St. then south on 6th Ave. The march will have 3 exits along 45th, 44th, and 43rd St.
A map can be found on the March’s FAQ page. Signs: Signs and banners are encouraged with a few caveats. New York City prohibits any signs that use poles, sticks, or handles as they can become weapons. Also, the March organizers would like to remind participants that children and media will be present. Keep it clean and keep it on message. Be creative! We will have a Bryn Mawr banner. If you are representing a different school please bring something to identify yourself! We want this to be as inclusive as possible. Weather and clothing: Be sure to check the weather forecast and dress accordingly. As the route is fairly long and there will be periods of standing, be sure to wear comfortable shoes. For more info about the Women’s March ON NYC Alliance. Let us know you will be joining us. For questions, contact: Helen Freeman ’02, hfreeman520@hotmail.com. WHEN: Saturday, January 19, 2019. Meet at 10:00 AM; we’ll start walking at 10:30 AM. WHERE: Meet in front of the Beacon Theater, 2124 Broadway between 74th and 75th Streets.